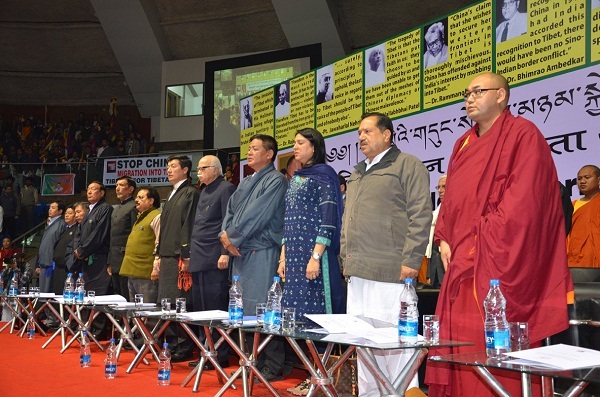 » Launch of the Tibetan People’s Solidarity Campaign At Talkatora Indoor Stadium. 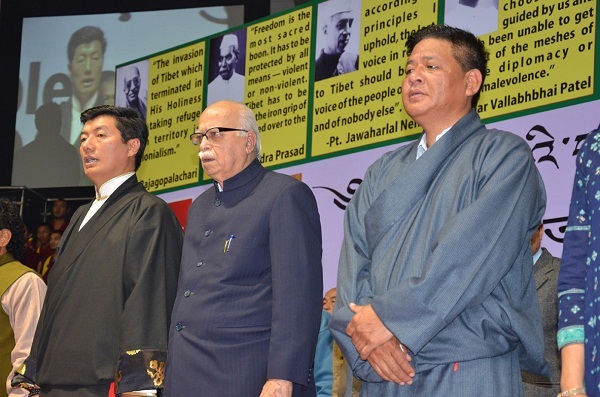 Sikyong Dr Lobsang Sangay and Speaker Penpa Tsering with Shri L K Advani, former Deputy Prime Minister of India at the launch of the Tibetan People’s Solidarity campaign at Talkatora indoor stadium, New delhi. January 30, 2013, Delhi: Various representatives from Indian political parties gathered at the Talkatora indoor stadium where the inaugural ceremony of ‘Tibetan People’s Solidarity Campaign’ was held. Over 5000 people, including 4500 Tibetans from India, Nepal and Bhutan and about 1000 Indian supporters from Delhi, NCR region and Ladakh were present at the function. Shri L. K Advani, former Deputy Prime Minister graced the ceremony as the Chief Guest. Shri Priya Dutt, MP and Dr. E.M Sudarsan Natchiappan, MP were official Congress party delegates. Shri Hassan Khan, MP represented National Conference. Dignitaries at the launch of the campaign at Talkatora indoor stadium, New Delhi on 30 January 2013. Shri L.K Advani shared few excerpts from Sardar Patel’s November 7, 1950 letter on Tibet addressed to the then Prime Minister of India, Pandit Jawaharlal Nehru. Ms Priya Dutt, expressed ‘concern and solidarity for Tibetans inside Tibet and paid homage to 99 young lives sacrificed in a struggle to regain identity.’ She thanked the Tibetan people for the presence and blessings of His Holiness the Dalai Lama in India. Ms. Dolma Gyari, Minister for Home, Central Tibetan Administration (CTA) was the master of the ceremony and Mr. Tempa Tsering, Representative, Bureau of His Holiness the Dalai Lama proposed the vote of thanks. 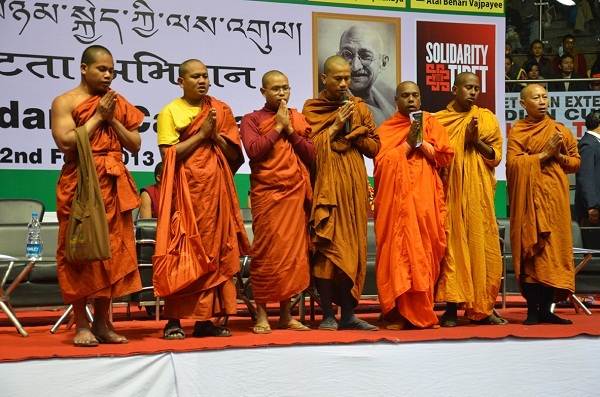 Monks from various Buddhist countries reciting prayers.